The Hudson-Bergen Light Rail (HBLR) Route 440 Alternatives Analysis developed conceptual alternatives that would increase transit access for Jersey City’s western waterfront neighborhood and then evaluated those alternatives to determine which should move forward. The final selected alternative is the “Locally Preferred Alternative” (LPA). Project Initiation: In this step, goals and objectives for the project were established that would be used to develop alternatives. Develop/Refine Alternatives: The second step consisted of development of initial concepts for alternatives that might meet the project’s goals and objectives. These concepts were then compared and those that met the project’s goals and objectives were advanced for further study. Evaluate Alternatives: In the third step, the remaining alternatives were developed in more detail and evaluated for their benefits and impacts related to cost, constructability, operations, ridership and environmental considerations. At the end of this step, a single preferred alternative was selected to be advanced for more detailed environmental evaluation in accordance with the National Environmental Policy Act (NEPA). Throughout the alternatives analysis process, Technical Advisory Committee meetings and Public Open Houses provided valuable public and stakeholder input for the study team. Several opportunities to comment on the proposed project were provided through the project website and at public and stakeholder meetings. This feedback was instrumental in the recommendation of the chosen LPA. 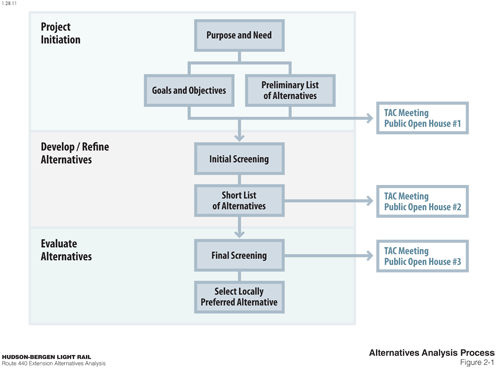 Each step in the alternatives evaluation is documented in a final Evaluation of Alternatives report, which was completed in February 2011. That document is available here.